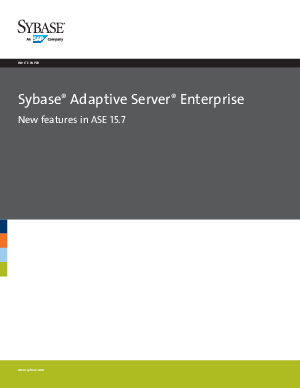 Sybase ASE 15.7 is the latest release in the ASE 15x product line. It offers important enhancements for storage optimization, application developer productivity, performance, enhanced diagnostics and monitoring, security administration and more. Download this document for an overview of some of these capabilities and the benefits customers can expect from moving to ASE 15.7.